As the weather warms up, Utah’s motorcycle riders start hitting the road. But, since most of them haven’t been riding since late last fall, drivers may not be used to seeing them and looking for them. New billboards posted by DPS aim to remind drivers to keep an eye out for our two-wheeled friends. Three billboards posted along the I 15 corridor are unique in that they feature an extension of a motorcycle rider that is positioned perpendicular to the billboard itself. This is the billboard posted at the 600 South exit of I 15 in Salt Lake City. The extension means that to see the motorcycle, drivers must actually look twice. 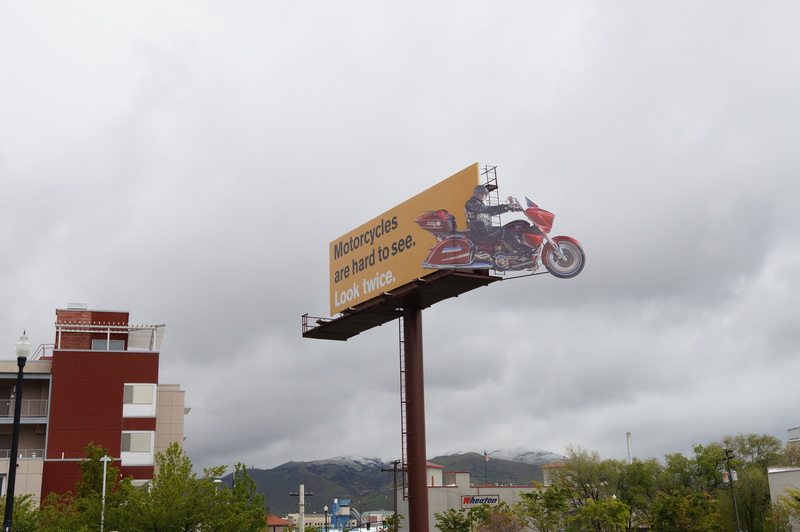 Keep an eye out for the billboards and an even sharper eye out for motorcycles. You can watch a Fox 13 news story about the media event DPS held to announce the billboard postings here.